When a baby is born, he or she needs to be checked by a chiropractor that specializes in working with children. Adjusting a baby is very different than adjusting an adult. In our office, we gently check for proper spinal movement, muscle tone, and ligament flexibility, in addition to assessing the infant for normal reflexes and any cranial imperfections. Gentle computerized spinal scans can be performed to assess variants of temperature and muscle imbalances along the child's spine. Any abnormal findings indicate the need for the baby's spine to be checked by a chiropractor. Occasionally, parents ask why an infant would need to be adjusted at all. Consider for a moment THE most strenuous and stressful event you have ever experienced. Birth is designed to be head first, unassisted by technology that pulls on an infant's delicate spine. An infant's head and neck are built for compression, which is the normal force exerted during a natural birth. Assisted treatment, whether with forceps, vacuum extraction or a more forceful C-section all require a pulling strain on the infants under-developed spine. Consider how the doctor later hands the infant to the mother - with two hands, one under their body and one under their head, because the neck is not built to withstand gravity, yet. While every newborn needs to have their spine checked, ANY child born with ANY assistance requires a chiropractic evaluation to assess for proper spinal alignment and joint range of motion. Waiting until their spine grows, tightens and develops abnormal patterns of movement can be among the most regrettable decisions a parent can make regarding their child's health and nerve system development. A normal, healthy nervous system is crucial for a developing infant - especially while they are still in the womb!!! Within 7 hours after conception, the growing embryo begins the crucial steps of creating a nervous system. This immature nerve system then begins to create all the other systems of the body. As the master system of the body, the nervous system is THE most important system in the body, which is why its development and function are so critical to a healthy life. Being the ONLY organ system completely protected in bone not only lends merit to its importance, but also greater clarity as to how and why problems can exist. With protection and stability come limitations to motion and flexibility. Maintaining proper flexibility to the spinal joints maintains proper flexibility to the spinal cord, which ensure normal, healthy function. This is as true on the first day as it is on the last day of a person's life - and every day between! Your nervous system creates the optimal environment for your baby to realize his or her greatest potential. Many women who get adjusted throughout their pregnancy notice the benefits of chiropractic care and educate themselves on the importance of a properly functioning nervous system. This becomes especially true for their developing infants and children. Even natural births can stress a baby's spine. Breastfeeding problems can arise if the baby has a subluxation and is unable to comfortably turn its head to one side. Mothers can rest assured that their infant will receive safe, highly specific and gentle adjustments to correct subluxations. Actually, the pressure used to make an adjustment to an infant is the same pressure you would use to test the ripeness of a tomato. A chiropractic adjustment is no more dangerous to a child than a regular check-up with a pediatrician. Similarly, periodic spinal checkups are needed as the infant transitions through various milestones throughout the first year and beyond. Interestingly, most mothers' remark at how their baby relaxes during and after the adjustment, oftentimes falling right to sleep. As a baby becomes a toddler and a toddler grows into an older child, chiropractic adjustments are just as important. Children begin to participate in normal kid activities like riding a bike or skating, and these activities may lead to small spinal misalignments. If these subluxations are not addressed, they may lead to more serious injuries as a child grows. Many spinal problems found in adults began as early as childhood. Subtle traumas that occur throughout childhood will affect the future development of the spine and can interfere with the vital nervous system, ultimately affecting the body's ability to function at its best. Parents normally seek out chiropractic care for their children because of a trauma, injury, or illness. Seeking regular chiropractic adjustments will help to identify potential spinal injuries and make corrections early on before they cause more serious injuries. In addition to injury prevention, regular checkups can help a child with ear infections, allergies, asthma, and headaches. Dr. Rob do not treat the illness or disease; they check the child's spine for misalignments that may impair the function of the nervous system and helps to restore the body's ability to function at a greater state of health and well-being. For further information about children and chiropractic care visit the International Chiropractic Pediatric Association. 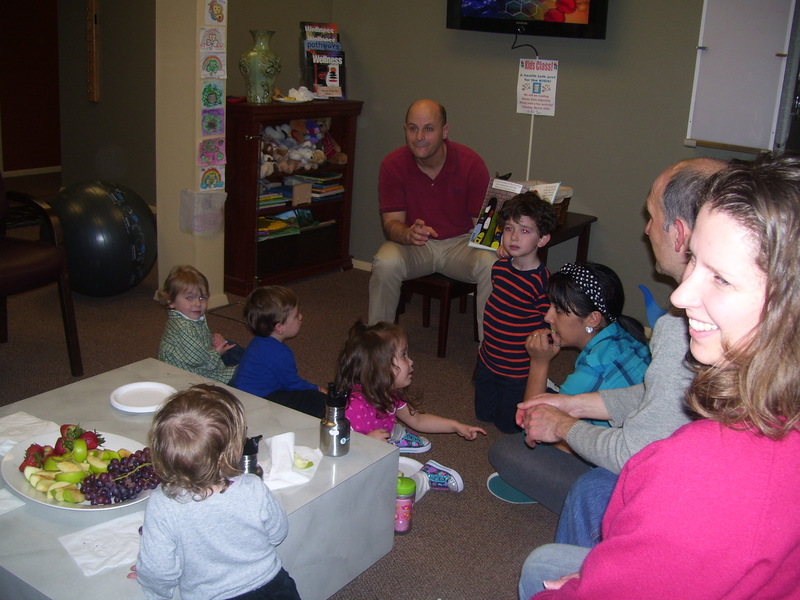 Click here to see what our kids are saying about Chiropractic!